Everybody has a story, big or small and I love hearing and reading about them. What I’ve not read or heard recently in the blogging community is about miracles. I’m not talking about “Oh, I had my electric bill that was past due and they were ready to shut it off but then a miracle happened where I won a scratcher at Circle-K” kind of miracle. I’m talking about seeing, hearing or reading about a real, true-life miracle. When I was a counselor at a camp in California, under the direction of one of my closest friends Tim, the last day of that camp we had to say our goodbyes to the kids who were attending. We had to travel down the road about a half-mile with the kids and their luggage, since the charter buses couldn’t make it up to the campsite. After saying our goodbyes, both Tim and I thought it’d be a good idea to just make the hike through the woods off the road, instead of up the road back to the camp. For fun. During this hike we came to a point where we had to make a decision. 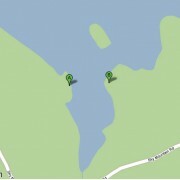 Do we walk around the lake or do we attempt to swim across since it really was only about 100 yards to the camp. Ok maybe it was only 50-60 yards, but it seemed like a mile. Google says it was approximately 200 feet, so there. With our clothes still on, pagers in one hand, paddling with the other AND our shoes still on, we attempted the swim. About halfway across the lake I started feeling like I was trying to swim while pulling a 350lb anchor. My shoes were the anchors, but I was so exhausted I couldn’t even think to go under and untie my shoes. I did, however, give up on trying to keep my pager above water. There I was in the middle of the lake, straight up and down trying with all my strength to tread water. I thought I could just hang out for a bit bobbing my head in and out of the water, taking small breaths of air to try and get enough strength for the remainder of the swim. Correction, up and down gasping for air. At this point I started looking straight up both out, and while under water. It was so quiet and so peaceful, but I was entirely in panic mode for I could not swim any longer. Then I heard the sound of splashing, somebody getting out of the water. My next trip to the surface I peeked over and saw Tim’s face. Pale white with terror, looking at me. He was terrified he was watching his best friend drown, right in front of his eyes. He could not do anything to save me for he was exhausted himself. I went back under, and back up. I couldn’t see him any longer. At this point, after seeing his face I started talking to God, and asking him everything that I could think of. I asked why he put it on my heart that I was going to have and raise children, if I were to leave earth now. I told God to not let the burden of me drowning stay with Tim, it was not his fault at all. I thanked God for allowing me to live such a safe and blessed life, compared to what I was exposed to while my parents still served in The Salvation Army, such as under-served people and communities. I praised God for being born in, and living in such a loving family with an awesome Father, Mother, Sister and Brother. I told God that I was a fool for not thinking this through, I mean how stupid am I that I didn’t think my shoes would weigh me down so much. I saw the water rip p l i n g.
I grabbed the hand, and started to move, getting towed by a pregnant woman, and her mother to the banks of the lake. I was safe, and I was alive. The way I see it, is that this fool’s God smacked me in the face and told me he wasn’t done with me yet, and even now I think that the women being there at that moment was more than just a coincidence. I know God had His hand on what went down at “The Lake,” and although I won’t go as far as to say it was a miracle, it is probably as close to one that I’ve experienced up until now. Ok, so now it’s your turn. I want to read, or hear, or see something big that God has done in your lives. He is not a small God, He is a GREAT God who does GREAT things. So tell me about them. -like 12 years ago when God delivered me the man of my dreams. I wish I still had the ‘check list’ of qualities I prayed for…that’d be a fun post! -the time our middle child needed us the most and we took action not knowing what would happen in the end. Our faith and trust proved to be the right move. My favorite miracle by far though is how God has kept you alive through your childhood. So many stories I have heard from your parents and thank God myself that your little trouble-making-self survived everything you have. I know this was hard for you to write, I heart your noggin. That check list would be pretty awesome. You should post. Do it. DO IT! Oh and those seasons with our marriage, and also with Madi was definitely rough, glad I went through it with you. A miracle in my own life? I still look back at in absolute wonderment and awe and realize only God was able to help me survive financially as a young, single mother. There were many times when my son was young that I had no idea how I was going to pay for groceries or bills, etc. looking back I remember so many times that God took that worry away. Example: I remember being at Safeway with about $20 in my budget and needing to buy baby food, and groceries for myself.. at the checkout I remember standing there silently praying that I would have enough money and not have to put anything back, on more than one occasion when the cashier handed me my receipt the manufacturer coupons that are also sometimes printed would include a free can of formula or jars of baby food. I remember being so grateful for something so small yet God knew how big that was to me. Some may believe that is merely coincidence. I, however know that it was truly His work at hand. Good post Ben. LOL why do you gotta tell my kite stories? jk, it was definitely not one of the wiser decisions I made, but it was still pretty freakin awesome. Wow Ben, what an amazing story. I can’t think of any other way to put it other than a miracle indeed. What if those women weren’t there at that specific time? I would hate to think there would be no Ben today. The world needs a Ben, your wife and kids need Ben, heck, I need Ben. You are a gift from God my friend, and this is a testimony of it. As for me? I have a few stories. But one is perhaps more dramatic than the others. It has to do with me and a retired police dog. I’ll share that with you sometime. Thanks Moe, your comments always lift me up and I appreciate it. And then God shows up……..always! My favorite song reminds me of you and Kim and what you are doing with your lives right now. Wow, I kinda really dig this song’s lyrics Mom, thanks for sharing it. Greatest miracle so far? I’m in. God ripping me to shreds and reaching down into my very soul to capture and take me into His covenant so that all the plans and intentions of our enemy were spoiled and cast to the ground like vain imaginations. He was not polite. He was not kind. He wanted me and I could not resist. He showed me His power, His Sovereignty, and His covenant. My God, You are my miracle. I wish I had some great story of seeing God make the impossible possible, but…my Salvation is the only one I will offer. Don I beg to differ on your last sentence, that story IS a great story! Crazy story, Ben! And I’m glad there was a miracle in it and you didn’t die. I’ve got a crazy miracle story that happened on a mission trip, but it’s too long to put in a comment. I’ll email it to you when I get a chance to write it up. Thanks for sharing this story, Ben. What a miracle! Awesome, thanks for sharing. I think it’s important that we recognize His work (for better OR worse), glad this turned out for the better. I’ve got no “miracle” story. Sadly, my life has been entirely to safe and predictable as a “rich, white kid from the suburbs.” Making decisions now that will change that. As my wife AND cyn stated in the first comments, it’s one of MANY of these kinds of stories. I’ll try and share as I remember them. Maybe. What an amazing story, Ben! There was a time that my husband and I fell asleep while driving across the state of Florida at night to go to see his parents and when we woke up, we were still driving on the road. We didn’t remember making the turn onto the road we were on. I know there are other things, but for the life of me I can’t remember them. Holy Moly! Both asleep? That’s nuts, but awesome he kept you on the road! My miracle stories have to do with being absolutely broke and then money showing up anonymously in the mail when no one knew that we were having that kind of trouble. Yes–stories–plural. Ha, and multiple times? That’s bananas. Whoa! That’s a crazy story. Glad you’re still here my friend. Two weeks after our wedding we were driving the last of L.K.’s stuff to my (now our) apartment. I fell asleep at the wheel doing 65 mph, went off the road, through a cable guardrail, down a hill and crashed into the concrete support holding up the highway. My wife was fine (some scratches and a sprained toe), but I was pinned in the drivers seat. It took 19 emergency personnel, 2 jaws of life, and 3 of these piston things 2.5 hours to get me out. During that time the truck would shift and buckle causing my body to get crushed. It was the single most painful experience of my life. I managed to escape with 40 stitches, a broken nose and nerve damage to my legs. I had to use a walker for 4-6 weeks, a cane for another 4-6 weeks and now you couldn’t tell I was ever in an accident except for the Frankenstein scar on my forehead. The whole time I was stuck and bleeding I kept asking God not to take away my legs and I was worried my new wife wouldn’t stay with me after I almost accidentally killed us. I wouldn’t recommend it, but that experience served to bond us closer together and God provided miraculously in that my legs didn’t break. Dude we are so happy you are here, seriously. I thank God for people like you KC, this story is absolutely amazing, and thank you so much for sharing. Adam your story is awesome. I already had this idea to share this Lake story, and seeing yours kind of inspired me to finish it and post. Thanks! This is a great story, I wish I had some dramatic story about me, maybe just the fact that God has let me live another day is the biggest miracle, because there have been so many times I have tried hard to do myself off with my horrible choices. When I was a Youth Pastor I had 2 major things happen to me. 1 we needed a van so I could transport kids, because our little mini van wouldn’t haul all of them so I prayed for a large van. The company I worked for was getting rid of large 15 passenger vans and I talked to them and I got one for $100, that was surely an answer to prayer. The other “miracle” for us was we were wanting to take the kids to an Acquire the Fire tour but most of the kids had no money and couldn’t afford it. We were praying and down to the wire. The next day it was due, one of the guys who worked in the youth group woke up with an envelop on his door of over $500 which paid for all of us to go. Truly God wanted us to go. Miracles happen every day big or small and if we look we can see them. Absolutely man, love how God shows up especially when it has to do with anything youth-related.